Forget the twists and the false bottoms; After Earth is not the M. Night Shyamalan film some might be expecting. At the same time, it’s not the Will Smith action flick various pieces of marketing might have billed it as. Rather, After Earth is your mid-level soft sci-fi flick that works tirelessly to keep things simple and inoffensive. While most sci-fi films try to, at the very least, challenge the viewer or impress them with intriguing concepts, After Earth takes a compelling set-up and then devolves into a fairly formulaic action adventure. 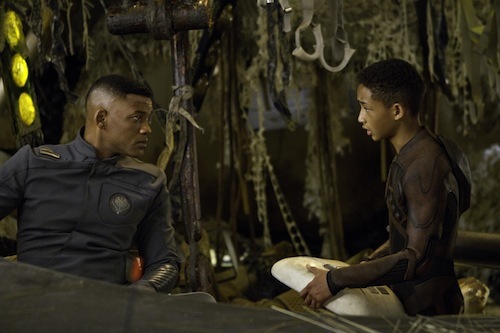 The film stars the father/son duo of Will and Jaden Smith as Cypher and Kitai Raige. Raige looks up to his father, idolizes him really, and seeks to become better than him in every way. And when the two crash-land on Earth – an Earth that has evolved to become a dangerous place for humans – Kitai will get that opportunity, as he works to save his father and himself. Kitai is not only at odds with the elements and all manner of deadly Earth creatures – futuristic monkeys, tigers, and birds – but also a creature called the Ursa, which has followed Cypher and Kitai from their new home planet, Nova Prime, all the way to Earth circa 3000 A.D. The Ursa cannot see but rather it can smell the pheromones humans secrete when they are afraid. However, if someone can learn to control their fear, like Cypher has and Kitai hopes to, they will have the upper hand on the Ursa. However, with Cypher indisposed, it’s up to Kitai to conquer his fear, lest the Earth swallow him whole. While that set-up might have its inherent alluring elements, After Earth is a very straightforward film. It doesn’t deviate too far off the beaten path, and it certainly doesn’t have the emotional weight of a film that features only a father and his son for the majority of its runtime. The narrative goes through the typical story beats, touches on obvious themes, and doesn’t have much to say, if anything at all. By the end, most moviegoers will feel like the film simply washed over them, and didn’t make its mark either with acting, story, or action. After Earth isn’t a bad film, mind you, just one that is unremarkable in practically every way. If nothing else, I was impressed with Jaden Smith who must carry the majority of the film. It’s no small feat when an actor must contend with exclusively CG creations, but the fact that Smith is just starting out makes his work in the film worth highlighting. He still has plenty of room for growth, but he does a serviceable job here. In fact, serviceable aptly sums up the entirety of After Earth. A lot of moviegoers will come away satisfied simply because After Earth is surefooted in its execution, even if it isn’t particularly memorable. Most, however, will struggle to find anything to latch onto in the film and will see After Earth as nothing more than a by-the-numbers, totally forgettable experience. After Earth‘s story is by far its weakest quality. Based on a story by Will Smith, the narrative is a run-of-the-mill adventure with few deviations or opportunities for excitement. For a movie that deals in some interesting sci-fi concepts and features more than a few fantastical elements, one would think After Earth would at least have a story worth following. Unfortunately, most of the intriguing elements of After Earth are pushed to the periphery. The film is quick to give audiences the set-up and then moves into a fairly formulaic, mission-focused rhythm. After Earth‘s script is unaffecting, to say the least, and frankly a little boring. As was briefly alluded to, most of After Earth‘s action sequences feature Jaden Smith up against some form of CGI creature. For the most part, he’s running from them, but occasionally he does get his futuristic cutlass bloody (well, CGI bloody). Unfortunately, most of the film’s action lacks the general excitement that is necessary for a successful summer blockbuster, save for a genuinely thrilling space crash sequence towards the beginning. It should also be mentioned that this is more a Jaden Smith vehicle than anything else. While the elder Smith’s Cypher is billed as a heroic icon, he spends the majority of the film guiding Kitai. In other words, if you’re heading in looking for a Will Smith action flick, you’ll be sorely disappointed. For that matter, if you’re looking for some original sci-fi action, you might feel that way regardless of your affiliation to the Smith family. Early on in his career, M. Night Shyamalan was focused more so on audience reactions than anything else. He built a reputation for the twist and lived or died based on the strength of that unexpected surprise. After a string of box office and critical failures, however, Shyamalan has gone in a completely different direction, creating a film that will elicit almost no reaction from its audience. Even on an aesthetic level, After Earth is fairly vanilla. Sure, Shyamalan’s direction is competent, and he delivers perhaps his most coherent film in a long while, but regardless of the stigma most still go into his movies expecting to, at the very least, feel that Shyamalan influence. That doesn’t necessarily mean a complex narrative, but a movie with clean, well-composed shots and imagery that evokes a particular mood or sense of place. 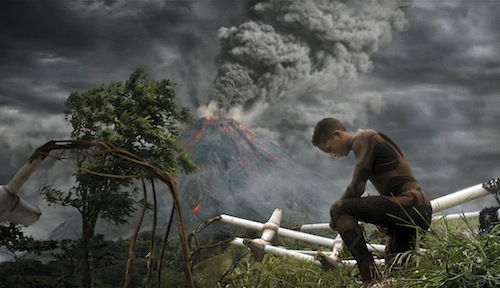 After Earth has a few scenes where that idea shines through, but they are few and far between.